A characteristic specialized building erected during the last years of the Turkish occupation and influenced by the imposing Neoclassical buildings of the major urban centres. Its severe symmetry is visible in the plans as well as at the facades of the structure. It is composed of separate wings surrounding a central atrium. The building was constructed at the end of the 19th century and it was planned to house the Turkish Military Hospital. The first floor was completed in 1900 and after the Courts of Justice were established, the surrounding area was properly arranged and lined with marble slabs. After a destruction by fire, the building was restored in 1936 and the third floor of the central wing was added. The building was protected by a preservation order in 1976. Restoration and preservation work was carried out in 1984, the surrounding area was remodelled in 1988 and restoration was resumed in 1990. 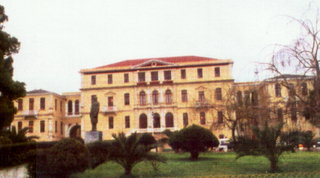 The building houses the Court of Chania, the Epheteion (Court of Appeal) of Crete, the Prefecture of Chania, the Lawyers' Association, the Civic Police Club and the Second Police Department.